Body Toolz is a company which has been in business for over 15 years, distributing their products to beauty salons worldwide. Body Toolzs is a member of several associations and their production has been featured in popular magazines. Body Toolz is providing professional beauty supplies, offering them at affordable prices. Company manufactures beautician and facial supplies, professional hair cutting scissors, precision tweezers, manicure-pedicure tools and many other beauty products. Their line of scissors include German Roseline Shears, pet scissors, thinning shears, barber shears and Korean shears. This Body Toolz professional hair shears set includes both hair cutting shears and hair thinning scissors. Both of them are made of stainless steel and coated with blue titanium which not only looks great, but also improves durability and thus longevity of these shears. Cutting shears have razor edge hollow ground blades which ensure razor-sharp and precise cut without pulling hair, but thinning shears have two kind of blades, because they are so called one-sided thinning scissors – one blade has 28 micro-teeth, but other blade has razor edge which provides fast and smooth hair thinning without any pulling or tearing. Both of these Body Toolz hair shears are 6 inches long which is known as the most popular and comfortable length for daily hair cutting. The total weight of this set which includes two hair shears is 7.2 ounces. Another feature of these hair cutting / thinning scissors is adjustable tension screw which allows to set a desired tension. They have non removable finger rest which helps to relieve the stress and thus discomfort from hands and shoulders, preventing development of occupational diseases. Unfortunately they do not have finger inserts for finger holes which usually helps to adjust the size, thereby improving fit and comfort. This Body Toolz professional set includes not only hair cutting and hair thinning shears, but storage case for these tools as well. 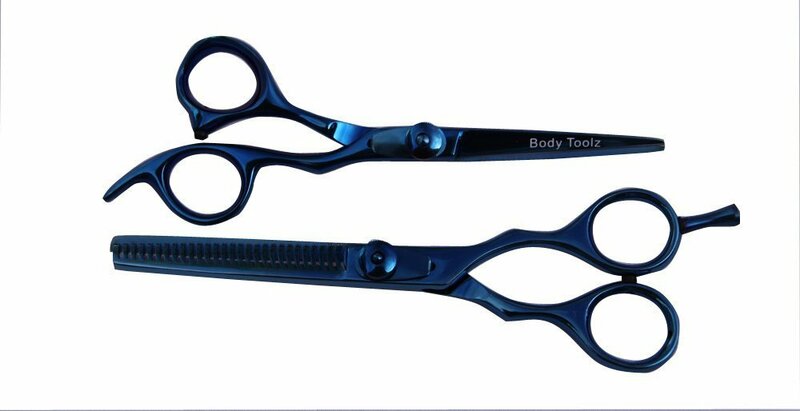 These Body Toolz hair shears are modern and stylish because of blue titanium which is coated over stainless steel base. As mentioned before, this blue titanium coat functions not only as design element, but also as protection coat which enhances durability and longevity of this product. Cutting shears are meant for hair cutting, but thinning scissors are intended for hair thinning or, in other words, for reducing of hair bulk in hair sections where it is needed. This Body Toolz product is more suitable for professional barbers, because they have all of necessary qualities, but hairdressing students can use them as well, if they can afford them. This Body Toolz professional set includes hair cutting shears, hair thinning scissors and attractive storage case. Both of hair shears are made of stainless steel and are coated with blue titanium which improves durability and design. Hair cutting shears have razor edge hollow ground blades, but hair thinning scissors have one razor edge blade and one micro-teeth blade, therefore, they are called one-sided hair thinning scissors. These tools are 6 inches long and 7.2 ounces lightweight. They have adjustable tension screw, non removable finger rest, storage case, but they do not have finger inserts for grip. Both professionals and amateurs can cut and thin the hair with these Body Toolz shears.